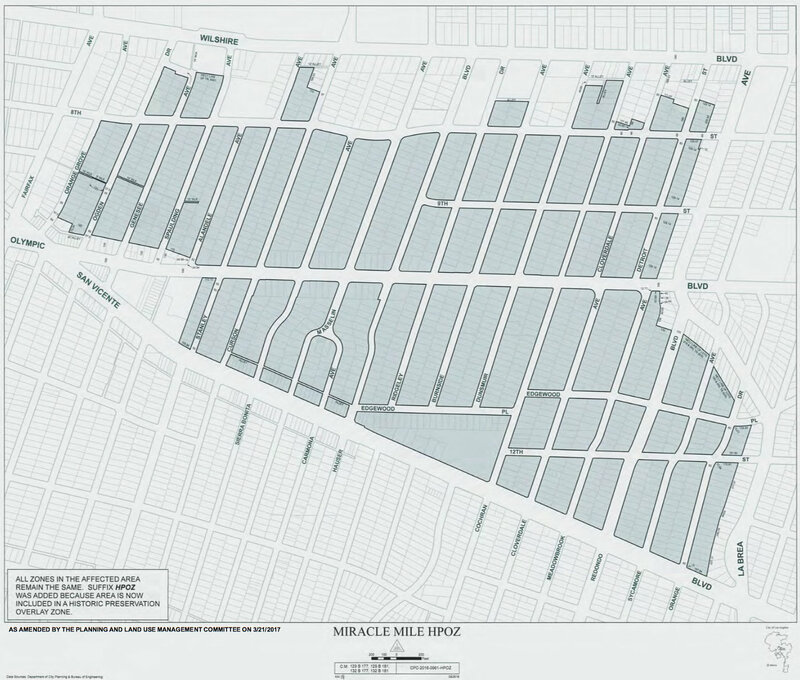 Every property within the boundaries of our HPOZ [see map] – multifamily and single family homes – is guided by a Preservation Plan that will serve to protect and preserve the historic integrity and scale of our neighborhood. Property owners should visit the Miracle Mile HPOZ page at the Office of Historic Resources website to familiarize themselves with our HPOZ, the Preservation Plan, and the approvals required for exterior changes to your property. When contemplating or planning changes to the exterior of your property first contact Christina Park, the city planner in charge of administrating our HPOZ. Christina is the point person referred to as “Staff” in the Preservation Plan. She can help you understand what approvals (if any) are required. She is also a great resource for information on how to maintain and restore historic properties. The best way to contact Christina is by email at: christina.park@lacity.org. She can also be contacted via telephone at 213-473-9987. The HPOZ guidelines do not apply to any building permits issued before May 1, 2017. This work is grandfathered in and no further approvals are required. HPOZ does not regulate interior renovations or remodeling as long as these changes have no impact on the exterior appearance of your property (i.e., altering window openings or door placement). 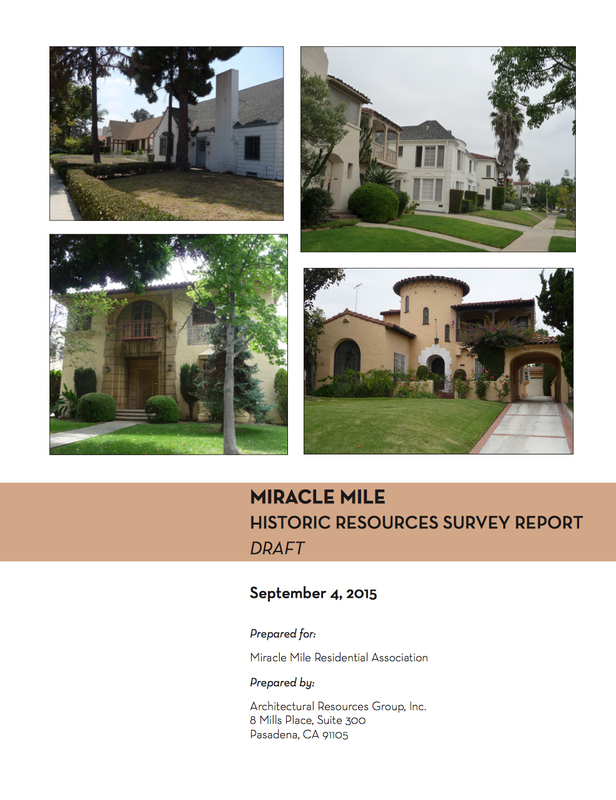 The Miracle Mile Historic Resources Survey Report provides a rich and detailed history of our community. A professional evaluation was made of every property within the HPOZ that determined whether it is a contributor, altered contributor, or non-contributorto our historic district. 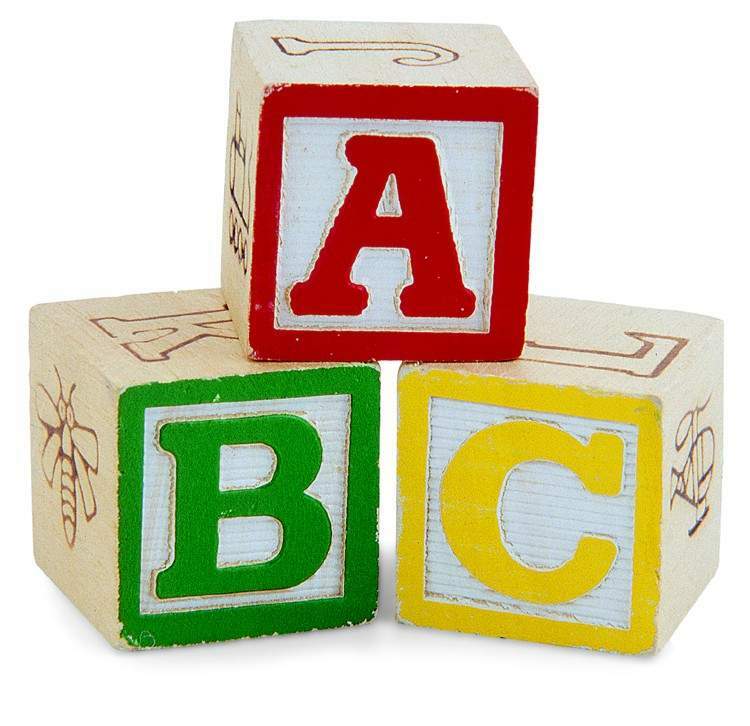 These categories determine how changes to your property may be made. There are different guidelines for contributors and non-contributors, as well as for new infill properties. The Miracle Mile HPOZ webpage has links that allow you to look up the history of your property by address and see how it was designated. Remember that the Preservation Plan provides guidelines that are meant to be flexible and still conform with the principles of historic preservation. Paint colors are exempt from HPOZ regulation as is landscaping (as long as 60% of your front yard and parkway consist of some sort of plantings and/or grass). Drought tolerant landscapes are permitted. Second story additions and Accessory Dwelling Units are allowed to single family homes as long as they are sensitive to the guidelines set out in the Preservation Plan. Also, many property owners are not aware that – HPOZ or no HPOZ – city ordinances already regulate fence heights, what percentage of your front yard may be paved, what kind of trees can be planted in your parkway, and many other aspects of your property. The city also requires permits for routine work that some property owners consider DIY projects (installing new hot water heaters, replacing plumbing fixtures, window and door change outs, etc.). Unpermitted work can negatively impact your property value, compromise your insurance coverage, and cost you additional expenses to remedy. So, when it doubt, whether it be city building permits or HPOZ guidelines: check first. For more information on HPOZ permits and approvals visit the Frequently Asked Questions page at the Office of Historic Resources’ website. You can also visit the Information for Property Owners page. at the Office of Historic Resources’ website. Miracle Mile HPOZ Chairperson Mark Zecca talks with Robby O’Donnell about how an HPOZ is administered and how it impacts property owners. It contains a wealth of information for property owners; information on special financial incentives and tax breaks to repair or restore historic properties; and other frequently asked questions.